Happy that miss Goodall made it out safely. Now she can retire, write a book then have it turned into a movie. Any projections on the possible actress? I would hope for Margot Robbie, the girl has chops! 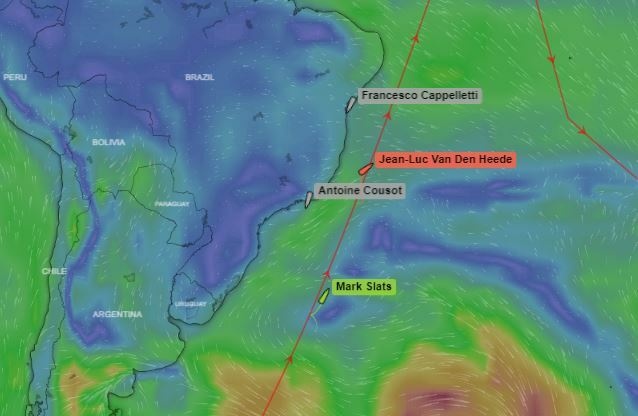 JEAN LUC VDH is entering the zone of headwinds slowing progress. It will hold for the next four or five days, maybe longer. He has been up the mast again just to check. He seems happy enough for now but is faced with many new decisions. One thing is certain he will protect his mast at all times. This will mean slowing even more losing ground to his rival who now sails with strong incentive. In the days ahead expect to see Jean Luc lose hundreds of miles from his lead. The next two weeks will e hard on the mast maybe? MARK SLATS is hand steering through the night surfing on the best waves driving hard knowing he can make big gains on the leader of the GGR in the next week. His boat is in good shape and he is feeling strong and excited at the new race to the finish. It is still thousands of miles away be for mark every day every hour is important.! Anything can happen to any GGR sailor so he has to be careful himself, but he is running on excitement! Can he do this? 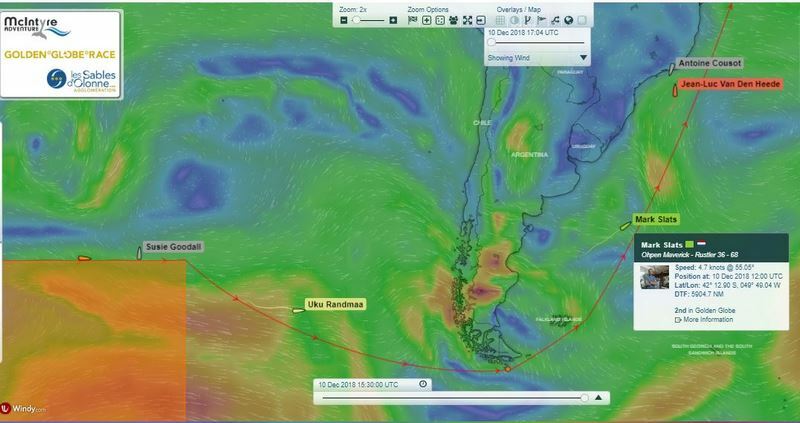 UKU RANDMA is planning to be at CAPE HORN on the 17th December and the weather for the next week suggests no sever storms for him. He is still thinking of SUSIE's loss and how it happened. He also thinks of ARE, GREGOR, ABHILASH and LOIC so it is clear he will be happy to make it to the Atlantic and the run north as soon as possible. he feels uneasy but happy. He is deep south and heading further down. The emotions that play 24hrs a day on entrants are sometimes forgotten to us who follow the tracker. It can be intense for sure. ISTVAN KOPAR struggles on with wobbly steering and lack of water. He sits too close to the NO GO zone, but the weather is good and he is happy about that. He has been here twice before sailing around the world and misses the idea of trying to catch SUSIE! UKU is too far ahead but this GGR is an adventure with an unknown outcome so for now he sits fourth in the ranking an amazing achievement. He will push as best he can to get home as quick as he can staying safe! He needs rain! TAPIO LEHTINEN missed a big chance two days ago to finally clear the barnacles off his hull. It was calm sea and no wind. He had been waiting for this for two days as the forecast said. But along came TWO sharks to play around his boat all day. Then came the wind again from the right direction so he sails off but still tooo slow. Life in every other dimension is good onboard. His time at sea is his dream come true. Now he looks for another calm to make life even better. MARK SINCLAIR is working on COCONUT and did NOT eat the huge Barnacles removed that probably slowed him by 1.5kts. he is also working on his mind. He is home to a warm reception. He is sleeping on a bed, eating fresh food, having long showers and laughing with friends. The temptation is great to stay? will he? or will he rush for Cape Horn. LIVELY LADY and Sir ALEC ROSE sailed around in March? has COCONUT got enough time and is he going to be a CHICHESTER sailor...watch this space? IGOR ZARETSKY struggles with barnacles and now light head winds on the final run to ALBANY in Western Australia. His team is waiting and many locals are ready to help. He will be happy to arrive after all this frustration. Our prediction is that the garden on his hull will be unbelievable. we all know he is a strong sailor and a good sailor. his pace is not through his lack of skill or enthusiasm. It is because of one simple mistake in Les Sables D'Olonne when they lifted their boat days before the start to wash the bottom and did NOT repaint! Now it is all about to be revealed! He arrives in a few hours. We would like to express our deepest gratitude to everyone involved in the successful rescue of Susie. MRCC Chile, MRCC Falmouth, the Golden Globe Race organisers, and especially the master and crew on Tian Fu, have given it their all over the past few days. It was with a heavy heart Susie left DHL Starlight to fend for herself, before she fills with water and rests on the Pacific Ocean floor. DHL Starlight has been her home for the past few years; a faithful friend who stood up valiantly to all the elements, a guardian until their last moments together. Once aboard Tian Fu, Susie remarked how enormously welcome the crew made her feel. They offered lots of food and drink, and over the next week or so she'll have plenty of time to rest en route to Argentina. When she was younger, Susie loved doing somersaults on trampolines. We just never thought she’d do one in a boat. Jean Luc Van Den Heede is still pushing head winds while Mark Slats rockets north with tail winds rapidly closing the gap. In the next 24hrs he should be just 700 miles behind and putting more pressure on before his winds move to the north and slow him down as the high pressure center moves across. Istvan Kopar Solo Circumnavigator is rushing south as fast as he can to get below the storm forming to his northwest. At this stage the tactic seems to be working as the system moves as predicted so far but this could change. He Gybed across last night and he will run with the strong NW wind until the storm arrives in about 24 hrs. 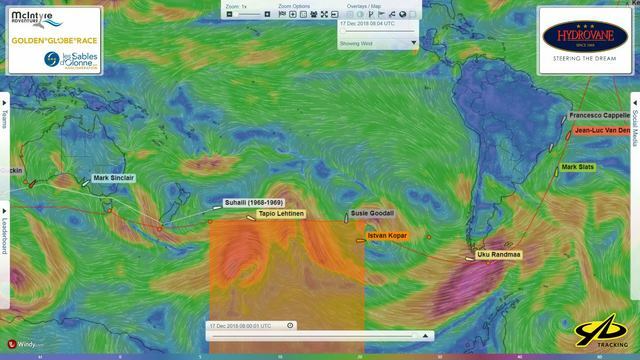 Once through that he will have to keep looking over his shoulder as more Southern Ocean heavy weather will be pushing him toward the Cape Horn. Tapio Lehtinen is happy in his world with the expectation of a slow trip to the east and Uku Randmaa Golden Globe Race 2018 continues to drive as fast as he dare to get around the corner while the weather is favorable. Игорь Зарецкий IGOR is still happy as can be to be free of his Barnacle farm and wants to get going as soon as possible. 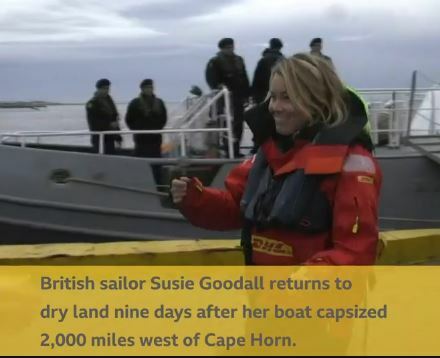 Susie Goodall Racing will be off the ship tomorrow and word is that there may be quite a bit of media waiting for her on the dock along with her mother. To step foot on land for the first time in 165 days will be another quite strange sensation and our thoughts are with her. PARIS NAUTIC Boat show... All the GGR team are at the Nautic for a GGR Les Sables d'Olonne Agglomération PRESS EVENT starting at 1100hrs local time and JL VDH will call in. If you are around you are all welcome. we will be on the VENDEE Stand HALL 1 just beside the MAIN STAGE! see you there. 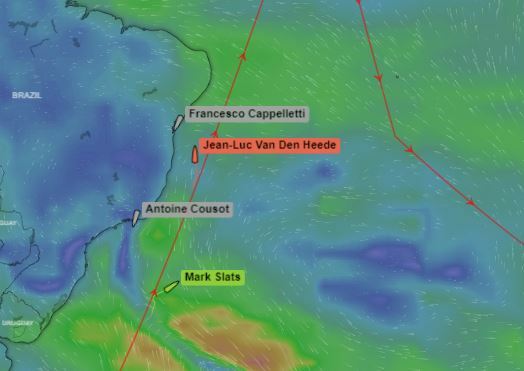 As French race leader Jean-Luc Van Den Heede works to protect his shrinking lead over 2nd placed Dutch rival Mark Slats, the focus is once more on a violent storm in the Southern Ocean that looks likely to overtake 4th placed American/Hungarian Istvan Kopar on Friday. 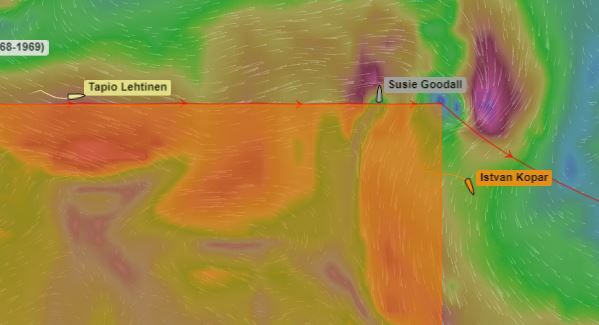 Race HQ has given permission for Istvan to take evasive action and move south into the NO-GO Zone, just as Estonian Uku Randmaa did to avoid the same storm that left Susie Goodall dismasted and in need of rescue a week ago. Race Chairman, Don McIntyre says: “We have just advised Istvan to head south as fast as possible. We hope he can make at least 180 miles, which is the lower marker on the distance track. We then have to hope the forecast track of this storm will be correct. Going South has risks because it takes him closer to the centre of the storm and sudden wind shift zone? But if he gets south he may miss the worst of it. Jean-Luc Van Den Heede tacked to within sight of Rio’s Copacabana Beach today and is now entering the zone of headwinds that is likely to slow his progress considerably. The 73-year old has climbed Matmut’s mast again to check that his repairs to the lower shroud tang fastenings remain secure and seems happy enough for now, but these head winds will concentrate his mind on protecting the rig on his Rustler 36 at all cost. This will invariably slow the Frenchman down. At 12:00 UTC today, Matmut’s lead over Mark Slats rival Rustler 36 Ohpen Maverick is down to 946 miles, a loss of 76 miles during the past 9 days. That’s not enough of an average to overtake the Frenchman, but Slats knows this could all change during the next two weeks. He is hand steering much of the time, including at night, driving the boat hard and surfing on the best waves, knowing he can make big gains on the leader. His boat is in good shape and he is feeling strong and excited at this new race to the finish. The finish back in Les Sables d’Olonne is still some 5,000 miles way, but for Mark every hour of the day is important! He knows that anything can happen, so he has to be careful himself, but is charged with excitement. Can he make up the difference? Susie Goodall is due to be dropped off at Punta Arenas on Friday when her rescue ship, the MV Tian Fu picks up a pilot prior to navigating through the Magellan Strait. She will be greeted by her Mother. One to miss her rivalry is Istvan Kopar who had been 780 miles behind when her yacht DHL Starlight was pitch poled and dismasted 7 days ago. But Kopar has his hands full. Not only is he facing a similar storm, but is struggling with major steering issues on his Tradewind 35 Puffin and also running very short of water. Nor does he have a working radio to pick up weather reports so is reliant on Race HQ to advise him about approaching storms as a safety measure. For now, he sits 4th overall – an amazing achievement considering. And perhaps this storm will have a silver lining and bring him rain! Tapio has since reported a leak in the bow, which he is trying to fix, and though he now has the winds from the right direction for a change, he is still making slow progress across the South Pacific and must wait for the next calm to finish off what the sharks began. Australian Mark Sinclair whose Lello 34 Coconut has also been plagued by barnacle growth, reached his home port of Adelaide last week just as his water supplies ran dry. He has decided to retire from the Race. Speaking by phone, he says that barnacles had slowed his yacht considerably, and though a team of friends had rallied round to clean the hull and make other repairs to the boat, he was concerned that reaching Cape Horn in early March was a little late in the season. Barnacles also proved the downfall of Russia’s Igor Zaretskiy who put into Albany, Western Australia on Wednesday to clean the hull of his Endurance 35 Esmeralda and replace a broken forestay. He blames the barnacles on a simple error of judgement made two days before the start from Les Sables d’Olonne, when he slipped his boat to wash the bottom and did not take the opportunity to apply another coat of antifouling. Zaretskiy is now demoted to the Chichester Class for making a stop and hopes to set sail again on Monday. This leaves just 5 of the original 17 starters competing in the Golden Globe Race. Race leader Jean-Luc Van den Heede is scheduled to make a satellite phone call to the Paris Nautic Boat Show at 10:30 UTC (11:30 French time) on Thursday 12th Dec during a media event on the Les Sables d’Olonne Agglomeration stand. All entrants will be presented and plans for the arrival of the first boats home late January and the grand prizegiving event on April 22nd will be announced. After arriving in Punta Arenas today, I’m still a little wobbly both emotionally and physically as I find my land legs again. I arrived with a heavy heart, no longer a competitor in the Golden Globe Race – but here is certainly a lot better than the alternative. And I wouldn’t be here today without the incredible support and seamanship shown by so many people over the past 10 days. I want to start by thanking MRCC Falmouth. After successfully picking up my distress call following the incident on Wednesday 5th December, they worked quickly and efficiently with the Golden Globe Race organisers to pass the information onto MRCC Chile. To the captain, crew and owners of Tian Fu, to whom I owe so much, soon diverted their course having received the request. Thanks to the precision and professionalism of the ship’s captain, I was safely found and lifted aboard, onto a somewhat bigger boat! Sailing away from DHL Starlight was heartbreaking, she stood up valiantly to all that the elements had to throw at her and looked after me until the last. Onboard Tian Fu, although there was an obvious language barrier, I felt very welcome and was made as comfortable as possible for the week-long journey into Punto Arenas. After 157 days alone at sea and a very emotional week to follow, I was fighting back the tears as I stepped off the ship and saw my mum and oldest brother. My whole family (Tash, that now includes you!) have been my rock from day one of this journey, way back three years ago when I signed up to the Golden Globe Race. I have put them through a lot, and I know I have a lot of making up to do! But I want to thank them from the bottom of my heart for believing in and supporting me in the many, many ways they have – thank you. To my sponsors – what can I say. I had hoped to make it a full circle, but it just wasn’t to be this time. However, I wouldn’t have even made it to the start line without you and I certainly wouldn’t have been so well equipped. Thank you to Zhik, Selden, Marlow Ropes, Weleda, Adesaskews, Sport Kitchen, Invivo Clinical and of course, to my hugely supportive title sponsor, DHL. It was lovely to have Jaime and Andreas from DHL here to welcome me in today. DHL have supported me throughout this campaign above and beyond what I had expected. They offered help with logistics, communications support so I could pass on messages to family throughout the race and, the biggest thing for me right now, a ticket to get home! Having only just touched land today, I have not yet looked at my emails, social media or any media for that matter. However, the race organisers and my family have told me that the support from the public, both sailors and non, has been overwhelming. Thank you so much to everyone who has followed the race and sent messages of support. If you asked me if I would I do this again, now knowing what it’s really like, I would say yes in a heartbeat! But as I said to the Chilean Navy captain who brought me ashore from Tian Fu, “I created so much work for everyone involved in the rescue, to which he responded “Of course you must do it again!” You may ask why?! Some people just live for adventure – it’s human nature. And for me, the sea is where my adventure lies. Having grown up admiring Tracy Edwards and Ellen MacArthur, I just knew that one day I needed to try to do this too. Every seafarer understands the risks involved but that’s what makes us stronger and able to overcome other challenges in life. I can’t tell you what is next beyond spending time with family and friends over Christmas and enjoying a glass of glogg, but that fire in my belly is far from out, so watch this space…! I’d like to say a final good luck and fair winds to the remaining five competitors in the Golden Globe Race. I look forward to seeing you all at the finish line! UPDATE: SUNDAY 16th. 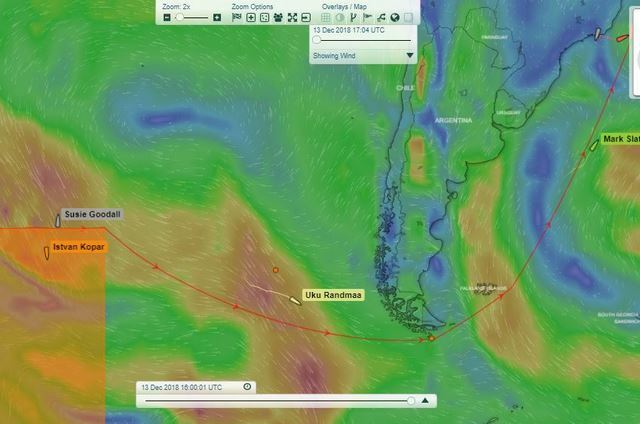 Jean Luc Van Den Heede is struggling again to reach the favourable easterly winds just north of him so continues to push in head winds while Mark Slats is also slowed dramatically by light headwinds..while to door is now wide open for Uku Randmaa Golden Globe Race 2018 to get around the CAPE HORN as the forecast storm there has dropped off a lot and he may now end up drifting around in light winds!. 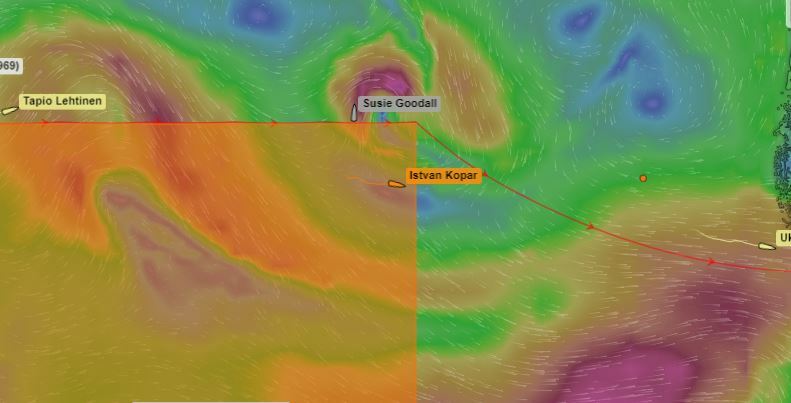 Istvan Kopar Solo Circumnavigator has to delicately thread himself between two storms and the second due on the 20th DEC looks to be one of the biggest seen so far in the GGR! He needs to be south of the first small storm but not drop below 53S latitude by the 20th or he may be in forecast 12-15 mtr seas and 60-70 kt winds. GGR is closely monitoring this. Picture shows ISTVANS current position ( he may be end of the BLUE line by then) but the weather is for the 19th DEC with the HUGE storm coming fast from the west. 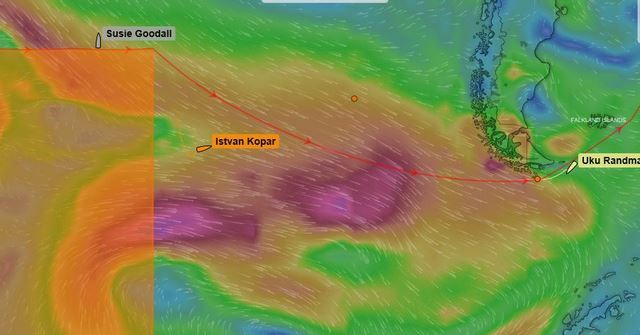 ISTVAN KOPAR looks to be through the worst of the heavy winds and sea at 0800UTC today but the 6 mtr seas will continue for some time. While much of his electrical system was wiped out months ago the boat is strong and his rig and sails are all in good condition ready for the next important 1500 miles toward Cape Horn. He is quite far south and can expect typical southern ocean weather for the next seven days with winds varying between 30 and 45kts and average seas from 4 to seven mtrs.It appears that his steering repairs may also be preforming OK but we look forward to hearing the story if he makes his scheduled weekly safety call today! TAPIO LEHTINEN had a superb with clear skies and crystal blue seas continuing his dream of being back in the Southern Ocean on a boat he loves. The No Go Zone keeping him north is giving him good weather no question. 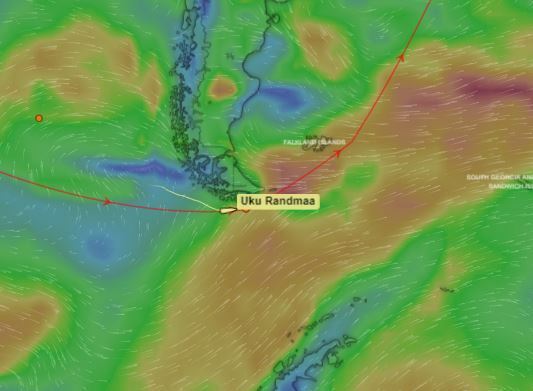 UKU RANDMAA is enjoying 3mtr seas and light following winds making only 3kts today but so relaxed to be heading out of the southern Ocean. I am sure he is having some good sleeping sessions now and thinking of family and Xmas! JEAN LUC VDH is happy that the easterly winds have finally arrived and should start to be more consist and in the days ahead but because he is close to the coast his course now needs to include some East! FREE SHEETS are still a dream for now as he is close reaching at 4.8kts in light 15-20kt winds and 1.5mtr seas. Mark slats is going FASTER! even with head winds so is slowly but steadily gaining ground. MARK SLATS spent a few hours in the water two days ago cleaning the bottom of his boat. He event went with sand paper to smooth the glue from left over Goose barnacles. he say his boat is faster now than ever with many supplies eaten so she is a little lighter and he knows his boat after the long journey so far. He still sails in head winds at 5.9kts better than expected and not far off his perfect course. From yesterdays phone conversation is obvious he works hard to catch J L VDH! Slowly he gets closer and all is well in his world!